Thank you to Mi Young Lee, who wrote these blogs after long days at the Arizona courts. The following is the final blog from Arizona. Click on the link above to read the whole series. Cockle-doodle-doo! We were greeted at the courts by a sun thinking about rising and a rooster from a nearby backyard. It was chilly again, but the kids quickly warmed up on the courts. The spectators huddled with cups of coffee and whatever extra clothes they could find in the car. 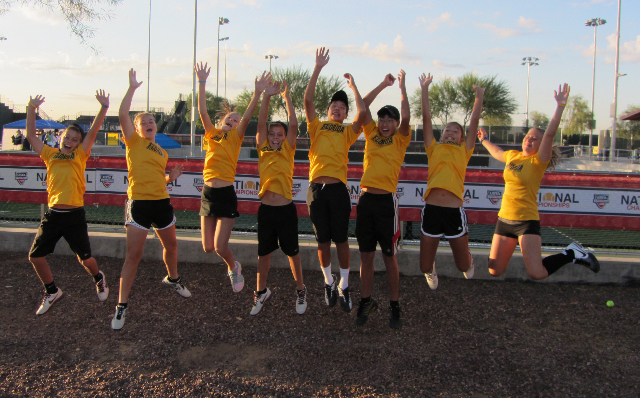 The ever-so-efficient USTA officials called the coaches to line up the teams at 7:15 am, 15 minutes ahead of schedule. The surprising thing is everyone was already ready to go. This was the final battle of the tournament. The kids were revving their engines, waiting for the checkered flag to let them loose. Our final battle was against the advanced team from Hawaii. (In a sign of friendship and spirit of the games, we presented their coach with a Gator lei. Never had the Hawaiian coach been presented with a lei before by a non-islander!) This would determine the winner of our flight. Our own little championship battle for 13th place nationally. Out of 12,615 teams nationally. Not bad. The doubles and singles courts went on simultaneously. Hyunsoo Ryan Joo played the boys’ singles court for this match. He is known for his strong, steady style of play. He exhibited his skills on the court today as he relentlessly ran his opponent from side to side, angle to angle, shot after shot. His tenacity and concentration were evident throughout this grueling match. Kendal Wilby was our girls’ singles player for the day. She is a determined warrior on the court, more focused and more heavy-hitting when she faces controversies and pressure. She was forced to play at a very high level for a very long, contentious match today, and she delivered. Harry Cacciatore and Jared Lee played boys’ doubles together for the first time in this tournament. (For each match, we had different line-ups with different combinations, requiring our players to be versatile and flexible enough to play with any other player on the team on a moment’s notice.) Their opponents looked semi-professional with extreme angle shots, perfect lobs and penetrating groundstrokes. And yet Jared and Harry encouraged one another through challenging rallies and situations to somehow emerge as the victors. Emily Louie-Meadors and Lillie Mehan represented our team on the girls’ doubles court. One of the Hawaiian girls hit the ball so hard that it was difficult to even track the ball as an observer. We could only flinch. Despite that, Lillie and Emily not only returned her bullets as effective groundstrokes but took them as volleys, never giving up any ground. They didn’t give up much ground in points either and claimed victory for their court. Grey Cacciatore and Ellie Wright played mixed doubles on the final court. Ellie was on fire with her sizzling groundstrokes, and Grey added every variation of shot imaginable to the partnership. They fought their way to a third-set tiebreak and never gave up. Each court sported a mighty battle to the finish. There were no easy matches, no weak competitors. Not even close. The will to win was strong on both sides of the net. No one won or lost for lack of skill, resolve or effort. This was not a match won by individual effort. The match came down purely to team effort. Every player had to bring it on the court today. And it took the mixed doubles team once again to determine the fate of the championship. This time, they delivered those final points necessary to seal the victory! We were victorious over Hawaii. To place the competitive nature of this tournament in perspective, we had lost to the ultimate 4th place team from Virginia Beach by a mere three games. Talk about tight competition! At the closing ceremonies, we were doubly surprised to be awarded the prize for Best Team Banner. All our kids filed out onto the stadium floor to receive their awards. 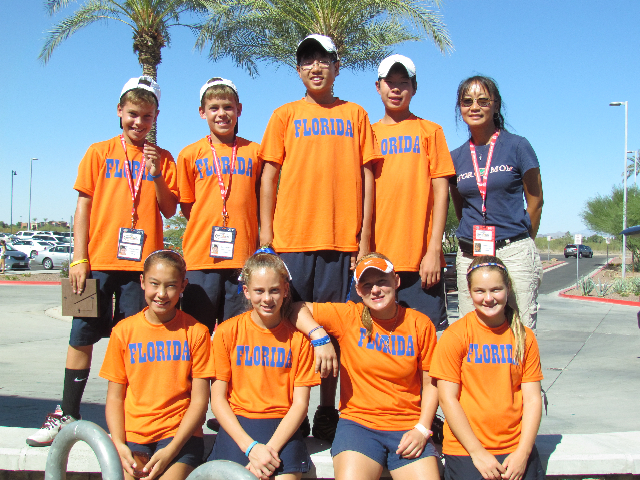 Smiles lit their faces as they proudly represented their beloved Florida. Whatever place we finished at the end, we were already a championship team in our hearts. Every single player tasted the thrill of victory, every single player tasted the bitter agony of defeat, and every single player played every single match. We started off as a team, and we walked out of the tournament as a team. More importantly, we stayed as a family. The defeats made us stronger and more determined. The victories sweetened the memories. This nationals experience will live on in our memories forever. Previous: Mehan Family of Gainesville Readies 3 for USTA League and JTT National Chps.